Basa’s Marine has a dedicated 2000 square foot Ship Store full of accessories for all of your boating needs. 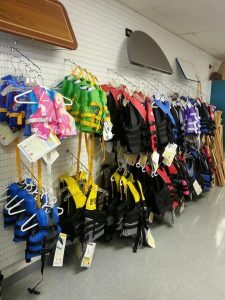 We carry tons of items such as life jackets, water skis, tubes, wakeboards, gel coat materials, mooring lines, fenders, hardware, winches, paint, caulk, lubricants, etc. So come on in and check it out, if we don’t have it, most items can be ordered and here the next day, or shipped directly to your house! We can special order any items that you may need! Please use this form to suggest any new item that you would like to see in our store! Please be as descriptive as possible, so we can meet your request!